Since the Antebellum era began at the end of the American Revolution and ended at the beginning of the Civil war, and included the first fifteen presidents, there was a wide and varying range of politics. Although there are volumes of political information from this time period, there are a few distinguished occurrences that define Antebellum America. Era of Good Feelings (1817-1824), when political issues were at rest for the time being. He was responsible for the Monroe Doctrine (introduced 1823) which said that Europe could not settle or colonize in North or South America. The Missouri Compromise (1820) was also signed during his presidency. The Missouri Compromise declared that below the border of Missouri, slavery was legal, but was illegal above it. Andrew Jackson was elected president under a new method where the Electoral College used popular vote. The Indian Removal Act (1830) was approved during his presidency and thousands of Indians were forced to leave their homes and move west of the Mississippi River to Oklahoma. This was known as the Trail of Tears (1838-1839). While Martin Van Buren was president, he established a treasury that was separate from the state banks, which caused much controversy. John Tyler signed the Log Cabin Bill that gave settlers the right to buy property before that property went up for public sale. James K. Polk is known for his zeal for westward expansion (Texas, California, and New Mexico were added to the United States during his administration, and the Oregon boundary was finally settled at the 49th Parallel ). While Millard Fillmore was president, he helped to open U.S. trade with Japan. He was also the last member of the Whig party to be president. During the administration of Franklin Pierce, the Kansas-Nebraska Act (1854) was passed. This act said that new Western states being added to the nation would be allowed to decide whether they would legalize slavery or not. This was known as Popular Sovereignty. James Buchanan is remembered as the president who failed to prevent the Civil War. During his presidency however, he sent troop to Utah to help keep order. This ended with the bloodless Mormon War (1857-1858). There were a couple wars that occurred between the American Revolution and the Civil War. 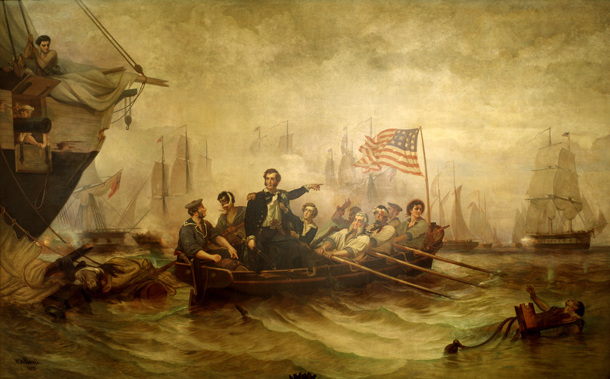 These were the War of 1812 and the Mexican-American War. The war was fought in three major areas: at sea, The American-Canadian frontier, and the South and Gulf Coast area. The war was ended with the Treaty of Ghent, which restored all land to it's original owners (there was no territorial change). -Fun Fact: The national anthem of the US (the Star-Spangled Banner) was a poem written by Francis Scott Key that was set to the tune of a popular British men's society club song. He wrote the poem after he saw Fort McHenry be bombarded in 1814 during the War of 1812. This was a war between the US and Mexico that lasted two years, from 1846 to 1848.
even though they had a treaty. This caused Mexico to declare war on the US. The American army captured the Mexican capital, Mexico City, and the war ended in 1848. The US ended up with the victory with the Treaty of Guadalupe-Hidalgo, which gave the California and New Mexico to the US for $15 million.